While reviewing an existing SF Leaning management deployment recently, I was surprised to see among a lot of things that the implementation partner consultants did not provide ease of navigation for LMS administrators between learning assignments (or BizX in General) and learning administration. The out of the box navigation to learning administration that most companies use is to navigate from anywhere in BizX is Admin Center /a Click Leaning /a Learning Administration. That is about three clicks. But using custom navigation, we can reduce the number of clicks and navigate to LMS administration very easily with a single click. In the following section, I am going to explain the configuration steps to perform this. Menu Item Label – Any Label the customer prefers. One may put a label like “Learning Admin. This label can also be localized using the Launch Locale Editor. Link Type – Options are External Link (New Browser), External Links (same Browser) and Internal Link. Menu Location – Provide where this option is made available from. Ideally, choose the top navigation and the active search. Action search Helps to search and navigate from the action search Permissions – Mention for which groups this option will be made available to. My recommendation is that this should be only made available to learning admin group. Now LMS Admin option would be available to learning admin group via top navigation and action search which is a very good thing. 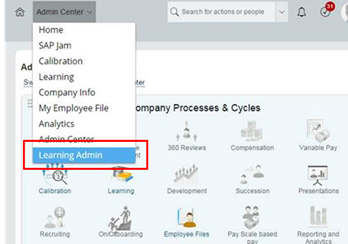 Note: The custom learning admin actions are visible in Manage Action Search immediately, but it may take up few minutes to be visible in action search results. (based on my experience). 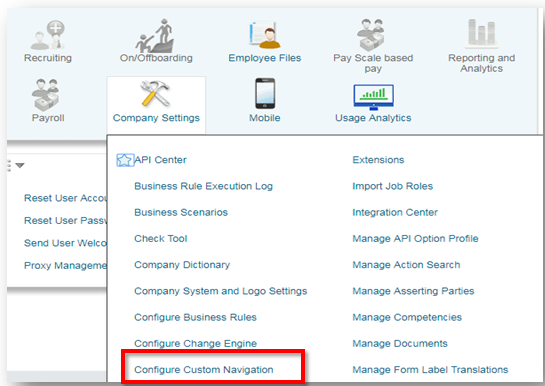 While the navigation option configuration is easy and clean from the BizX side, Navigation from LMS admin back to BizX has certain limitations. We can configure only one URL to navigate to BizX from LMS admin. While option one does not need any additional configuration, the configuration steps are given below need to be performed to navigate directly to either learning assignments or BizX Homepage. 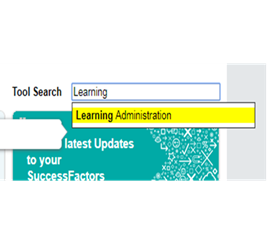 SuccessFactorsAdminToolsPath – where do you want to navigate back from LMS Admin. Now LMS Admins will be able to navigate from LMS Administration back to BizX home, learning or administration. In short, the custom navigation helps LMS administrators with reduced clicks, ease of navigation and ‘lesser’ frustration from the learning department. You can find the same blog posted on SAP Blog Site accessible at the following link.